History often leaves loose ends. I have my own copy of this flag, the Serapis flag, that I like to fly from time to time, and the thought comes to mind on Memorial Day of the years when the Republic, and its emblems, were still being invented, and this could pass for the American flag. The Serapis was the British ship that sank John Paul Jones’ Bonhomme Richardbut lost the battle between them on September 23, 1779, and was taken over by Jones’ mariners. They skedaddled to the island port of Texel, which was run by the neutral Netherlands. 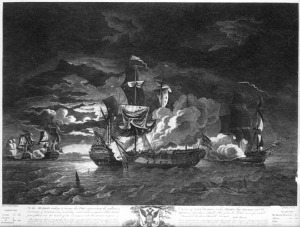 The British Navy hunted them down there and demanded that the Dutch officials in charge hand over the Americans as pirates. 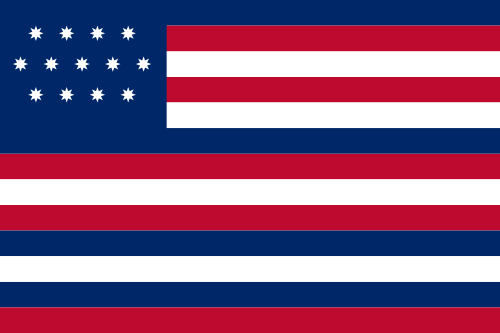 A flag was duly, hastily sewn up, the Dutch authorities discovered that they did in fact know that flag, and they duly “recognized” it, making it arguably the first flag of the USA ever recognized by a foreign power. Thanks to those who Serve.